This week we have our much-anticipated next meeting of Theology on Tap We will gather this Friday, 27th January, and we will be discussing the Canon of Scripture and how the Bible was formed. We will again meet at Gekko Garden beginning at 7 p.m. for food, drink, and chat! 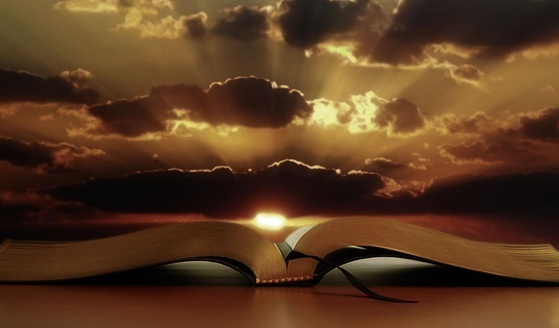 The scriptures are at the centre of our understanding of God, so our understanding of the scriptures is a crucial part of our faith and of how we “do theology”. I am sure we will share a wide range of views, and all ideas are welcome. Come on Friday if you can! Click here to read more and download some background reading to prepare for the night! Then on Sunday, after last week’s sermon on joy, which you can read here, I shall this week be looking at God’s love, and how our understanding of that love can strengthen and develop the joy in our lives and the lives of others. This Sunday’s readings are Micah 6:1-8, 1 Corinthians 1:18-31, and Matthew 5:1-12, and we will be singing the hymns Praise with joy the world’s Creator, The world needs love, I am the Bread of Life, and Tell Out My Soul. The readings can be found via this link! Are we ready to know God? It is still the season of Epiphany when we celebrate the revelation of God to the world! Are we ready to have God more fully revealed in our lives? Come to All Saints this week with expectation as we encounter the living God. This Sunday’s readings are Isaiah 9:1-4, 1 Corinthians 1:10-18, and Matthew 4:12-23, and we will be singing the hymns O Worship the King, Open my Eyes that I may see, One Bread One Body, and All My Hope on God Is Founded. The readings can be found via this link! Then next week, the next meeting of Theology on Tap will be on Friday 27th January when we will be discussing the Canon of Scripture and how the Bible was formed. We will again meet at Gekko Garden beginning at 7 p.m. for food, drink, and chat! If you don’t know the way to All Saints, directions can be found on the Where and When page. Most people get to hear about us via the internet or by word of mouth, so please feel free to pass on this email to others. The season of Christmas is over for another year, and we are now in the season of Epiphany. 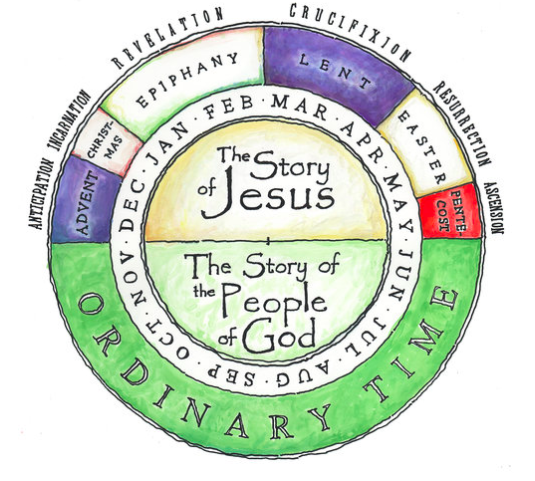 Nate Tipton shared this visual map of the Christian year which shows us how we reflected on both the story of Jesus and the story of the people of God. In Epiphany we emphasise that God has been revealed to us in Jesus, and this week we will be looking at how that revelation makes a different call on the life of each one of us. What has God, and is God, calling you to do? This Sunday’s readings are Isaiah 49:1-7, 1 Corinthians 1:1-9, and John 1:29-42, and we will be singing the hymns Let All the World in Every Corner Sing, Will you come and Follow Me?, One Bread One Body, and I the Lord of Sea and Sky! The readings can be found via this link! A little further ahead, the next meeting of Theology on Tap will be on 27th January when we will be discussing the Canon of Scripture. We will again meet at Gekko Garden beginning at 7 p.m. for food, drink, and chat! Our New Year’s Day was surprisingly well attended with over thirty people present, let’s hope this pattern continues in 2017. 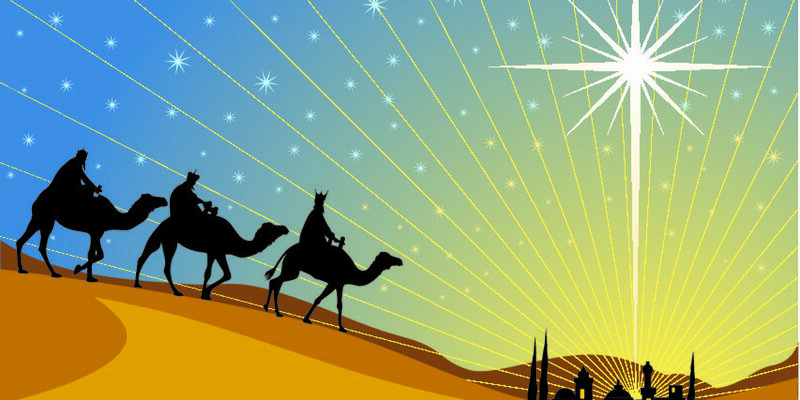 This week we celebrate the Feast of the Epiphany when we remember the Wise Men visiting Jesus. It also marks Twelfth Night, and so we will be taking out Christmas decorations down for another year! Despite all the trepidations we share as we enter 2017, I am optimistic that this will be a good year at All Saints. God is with us, and we can trust that God will lead us forward according to God’s will. Be excited – I am! Our readings for Epiphany will be Isaiah 60:1-6, Ephesians 3:1-12, and Matthew 2:1-12, and we will be singing the carols We Three Kings of Orient Are, The First Nowell, As With Gladness Men of Old, and Hark! The Herald Angels Sing! The readings can be found via this link!